The distinguishing characteristic of pediatrics as a unique medical domain is the breadth and depth of human growth and development that it covers. 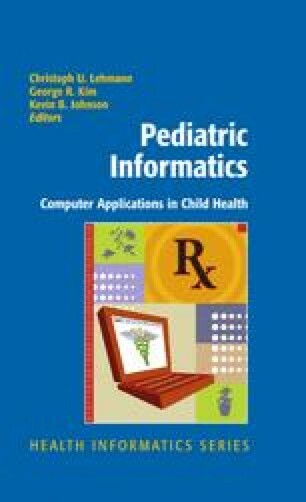 The range and variation in these parameters create many contexts in which clinical and administrative data is collected, interpreted, and used to provide appropriate care: to diagnose, plan, and manage therapy of an individual child's illness, to create relevant and effective care on group and population levels, and to study the needs of child health. Centers for Disease Control and Prevention. CDC Website; 2008. Available at: http://www.cdc.gov. Accessed April 22, 2008. National Center for Health Statistics. NCHS Website; 2008. Available at: http://www.cdc.gov/ nchs/Default.htm. Accessed April 22, 2008. Agency for Healthcare Research and Quality. Medical Expenditure Panel Survey; 2006. Available at: http://www.meps.ahrq.gov/mepsweb/. Accessed April 22, 2008. Agency for Healthcare Research and Quality. Hospital Cost and Utilization Project (H-CUP); 2008. Available at: http://www.ahrq.gov/data/hcup/. Accessed April 22, 2008. National Center for Health Statistics. National Health and Nutrition Examination Survey (NHANES); 2008. Available at: http://www.cdc.gov/nchs/nhanes.htm. Accessed April 22, 2008. National Center for Health Statistics. National Immunization Survey; 2008. Available at: http://www.cdc.gov/nis/. Accessed April 22, 2008. Centers for Disease Control and Prevention. National Vital Statistics System; 2008. Available at: http://www.cdc.gov/nchs/nvss.htm. Accessed April 22, 2008. US Department of Health and Human Services, US Environmental Protection Agency. The National Children's Study; 2008. Available at: http://www.nationalchildrensstudy.gov/. Accessed April 22, 2008. Vermont Oxford Network. VON Website; 2008. Available at: http://www.vtoxford.org/. Accessed April 2008.